Greetings blog subscribers (and casual readers, too)! When I first stumbled on today’s gorgeous botanical subject in the hilly areas around Chattanooga, I couldn’t believe what I was seeing. The passionflower is one of the most outlandish, garish, over-the-top, and beautiful blooms I’ve encountered in the wild. It looks as thought it would be more at home in a tropical nursery than growing in the foothills of the Appalachians, and yet this clinging vine with big, showy blossoms is right at home among sweetgum trees, sassafras, and tulip poplars. The flower is sort of ‘leveled,’ with a base of beautiful petals which come in vibrant colors like purple and pink upon which rest elevated pistils and soaring stamens in a delicate (and highly symbolic) pattern. The passionflower goes by several names, including the maypop, herb of the Cross, and maracuja. The latter name comes from Spanish-speaking localities in which the twining vine blooms, and the flower has definitely found a home in the folklife of Hispanic herbalists. But before I get ahead of myself with all of that, let’s look briefly at some of the Old World lore about this lovely bit of flora. The passionflower naturally fits into a schema of religious botany, then, and would seem to be a sort of pinnacle representation of the Doctrine of Signatures, which essentially states that every plant (or creatrure, for that matter) bears certain visual, olfactory, or other cues indicating what the divine intends us to do with it. Medicinally, this plant has a powerful sedative effect, though not one so strong as something like valerian root. This can be seen as a sort of ‘peace,’ bestowed by the plant as its creator would bestow divine peace. You can read a good bit about its medicinal qualities here and here, where they are able to get much more into the hows and whys of passionflower’s sedative effects. [Though I will note here, as I always do, THIS IS NOT A MEDICAL BLOG, AND I DO NOT PROVIDE MEDICAL ADVICE. PLEASE CONSULT YOUR PHYSICIAN FOR MEDICAL INFORMATION ABOUT HERBS, SUPPLEMENTS, OR ANY OTHER TREATMENTS YOU ARE CONSIDERING]. 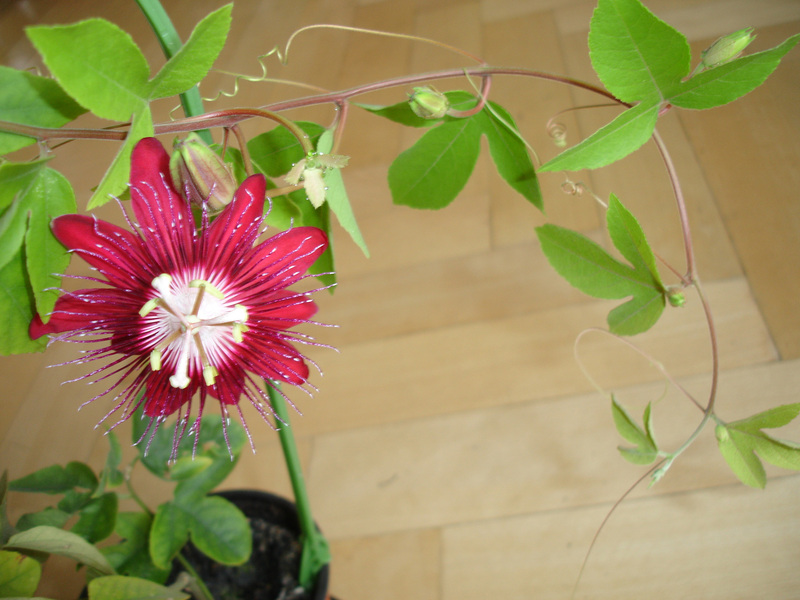 Moving into passionflower’s magical side, there is surprisingly little to do with its ability to inspire religious faith, offer any kind of divine protection, or even be used as a decoration on altars to holy saints, which greatly surprises me. I would think those uses would be nearly the first use I’d put them to, but wiser workers than I would note that passionflower’s real power is not just in its blossom, but in its less showy bits: the tangly and highly clinging vine which supports the gorgeous floral display. Beyond its love-bringing and binding qualities, the flower also seems to bring feelings of peace and contentment between lovers and members of a household, likely due to its soporific effects in its medical applications. In Latin American countries, the passionflower has similar applications, including use as a love-binder and spiritual sedative. It’s also used in a Brazilian floral horoscope, where it represents the month of June. Again, I’m surprised at its limited appeal as a holy or divine flower, as I think it would likely be an excellent addition to offering altars to Marian incarnations or to do work with Jesus in various forms. But that’s merely speculation on my part, so I digress. If you’ve had any experiences, magical or otherwise, with this amazing bloom, we’d love to hear about them! Feel free to leave a comment below or email us if you know more about this beautiful, intriguing addition to American flora. This entry was posted on April 20, 2012 at 9:30 am and is filed under Blog, History & Lore, Practice & Technique. You can subscribe via RSS 2.0 feed to this post's comments. My grandmother had this growing all over the fence. Hers were purple, taken from a cutting that was a gift from a neighbor. I just recently spotted the Passionflower growing on the trails in Murfreesboro, TN as well. Another awesome botanical post – many thanks, Cory.